The Fruit Of The Gods From An Indiana Tree? Ripe persimmon. Photo: Rebekah D. Wallace, University of Georgia, Bugwood.org. 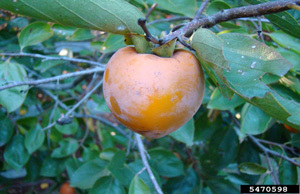 The American persimmon tree’s scientific name, Diospyros virginiana, is loosely interpreted “divine fruit” or “fruit of the gods” of Virginia. If you have tasted a ripe persimmon on a crisp fall day, you might agree with that assessment. Several persimmon tree species are found in both the new and old world and have been used for food and wood products for centuries. Our American persimmon is native to the southern half of Indiana but can survive in the northern half of the state as well. The ripe fruit is famous for the sweet orange pulp used in puddings, cookies and candies. If you are unlucky enough to eat a persimmon that has not yet ripened, your opinion of its eating quality will be quite different. Unripe persimmons have a high tannin content that makes the fruit very astringent – I describe it as feeling like your head is shrinking while simultaneously trying to expel a glue ball from your mouth! Most dedicated persimmon collectors wait for the fruit to become soft and fall from the tree before collecting to avoid this unpleasant experience. Contrary to popular belief, the fruit does not have to experience a frost to ripen. Persimmon fruit normally ripen in September and October, but some trees hold fruit well into winter. A warning to those tempted to over-indulge in persimmon fruit: the tannin in the unripened fruit can combine with other stomach contents to form what is called a phytobezoar, a sort of gooey food ball that can become quite hard. One patient had eaten over two pounds of persimmons every day for over 40 years. Surgery is often required to remove bezoars, but a recent study indicated Coca-Cola could be used to chemically shrink or eliminate the diospyrobezoar. There is very little risk to those infrequently eating ripe persimmons. Persimmon is related to ebony and has extremely hard wood once commonly used for golf clubs when “woods” where actually made of wood. The heartwood of persimmon can be black, like ebony, but significant dark heartwood formation may not occur until the tree is quite old. Persimmon is a medium-sized tree here in Indiana but can be over 100 feet tall in the bottomland forests of the Southern U.S. Where I grew up in Southern Indiana, my family ritual in the fall was to go to Brown County State Park and pick up persimmons, separate the tasty pulp from the skin and seeds and freeze the pulp for use in persimmon pudding and candy over the holidays. We might also collect some black walnuts or hickory nuts to include in the candy. We had to be diligent, as the opossums, raccoons and deer liked persimmon as much as we did. In addition to use for food, persimmon has some folk tradition related to winter weather forecasting. It was thought the shape of the embryo in the seed could predict the winter weather: a spoon shape indicated deep snow, a knife would indicate icy cutting winds and a fork meant it would be mild with plenty to eat until spring. I collected a few seeds from trees here on the West Lafayette campus and split them open to see what the tree wants to tell me – looks like a spoon to me, but you can make your own predictions. 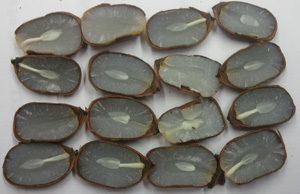 The Indiana DNR Division of Forestry Nursery sells American persimmon seedlings. You can also find selections for fruit production being sold commercially, along with several Asian persimmon varieties. Male and female flowers are normally formed on separate trees, so plant several to get good pollination.